Paul Badura-Skoda is considered to be one of the great pianists of his generation, as well as an important scholar who has created definitive editions of many of the works of the Viennese masters, most notably Wolfgang Amedeus Mozart. With his wife, the noted musicologist Eva Badyra-Skoda, he wrote the highly influential Interpreting Mozart on the Keyboard, first published in German in 1957, then in English and Japanese in 1962 and 1963, respectively. 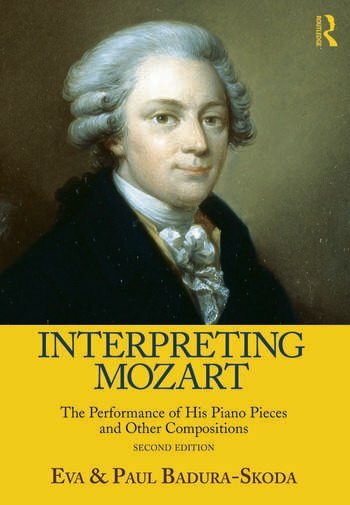 Long out of print, this important work has never been updated to reflect the last half-century of scholarship on Mozart's music. Now, the husband and wife team have tackled this project, producing an entirely new text that will serve students and scholars of keyboard literature and of the great composer. Paul Badura-Skoda is one of the most important pianists of our time. In 1945, Badura-Skoda entered the Vienna entered the Vienna Conservatory, and two years later won first prize in the Austrian Music Competition and a scholarship which allowed him to study with Edwin Fischer. In 1949, Wilhelm Firtwängler and Herbert von Karajan became aware of Badura-Skoda's outstanding talent, and invited him to play concerts. Practically overnight the young Viennese became a world-famous artist. Since then, Badura-Skoda has been a regular and celebrated guest at the most important music festivals, and a soloist with world's most prestigious orchestras. Eva Badura-Skoda is a musicologist, publishing extensively on the history of the piano and on performance-practice problems of the 18th and 19th centuries.